When NASA's newest satellite soared into space late Wednesday (Jan. 30), a team of photographers captured dazzling views of the rocket streaking into orbit. A series of long-exposure rocket launch photos released overnight by NASA show the unmanned Atlas 5 booster carrying the agency's new Tracking and Data Relay Satellite K (TDRS-K) as a bright arc of light climbing spaceward from a pad at Florida's Cape Canaveral Air Force Station. The rocket lifted off at 8:48 p.m. EST (0148 Jan. 31 GMT), rising like an artificial sun as it flew into space. One image, by launch photographer Tony Gray, shows the Atlas 5 rocket just seconds after liftoff as it appeared from NASA's Kennedy Space Center, which is near the Air Force Station launch site. NASA's cavernous Vehicle Assembly Building stands stoically in the foreground as the rocket hovers in mid-flight on the photo's right side. Another view, captured by photographer Rick Wetherington, shows the Atlas 5 rocket as a blazing arc of light as it passes behind a lighthouse at the Cape Canaveral Air Force Station. 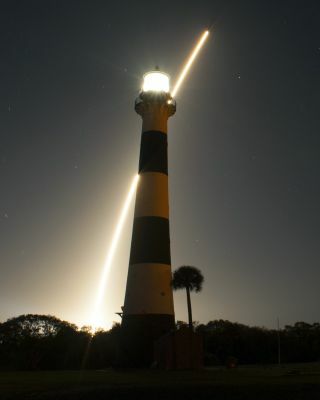 A final image by photographer Glenn Benson shows the rocket streaking up into the night sky, its blindingly bright engine plume reflecting off the waters around the seaside launch pad.Another view, captured by photographer Rick Wetherington, shows the Atlas 5 rocket as a blazing arc of light as it passes behind a lighthouse at the Cape Canaveral Air Force Station. The TDRS-K satellite is the first of three next-generation communications satellites to be launched in order to upgrade NASA's aging TDRS satellite constellation. The satellites serve as relays between NASA ground stations and the agency's Earth-observing satellites and other spacecraft currently orbiting the planet. TDRS-K is expected to spend at least 15 years in service once it begins operations, according to a NASA mission profile. The first TDRS satellite was launched into space in 1983, with TDRS-K marking the 11th satellite to join the fleet. The launch provider United Launch Alliance oversaw Wednesday's Atlas 5 mission for NASA.